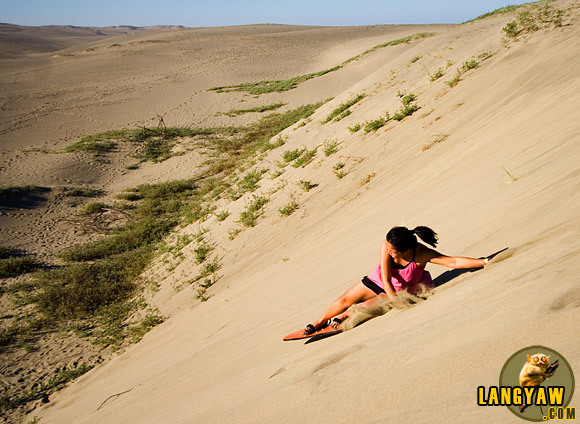 Sandboarding at the Ilocos Norte Sand Dunes is one of the newest attractions in the north. While this adventure sport has been around and is in fact popular in many desert areas around the world, here in the Philippines, its just starting. Last January 2010, I was invited by the North Philippines Visitors Bureau to join a media tour of travel writers and bloggers to experience North Luzon for seven days starting in Cagayan province all the way to Pampanga to sample the various local cuisines and experience the attractions offered by the various provinces along the route. The 4×4 offroad vehicles we took around the spectacular Ilocos Norte Sand Dunes in Paoay came to a full stop. We clambered down from our positions at the back and just surveyed the expansive environs and the sun was still a few degrees from the horizon. Not too hot. Wind is cool. Looking down, before us was a steep incline, deeper than what we’ve passed through earlier and we were then told that this will be the starting point. Seems daunting and from the looks of it, this would be one adrenaline pumping adventure. Mark Manahan showing how to properly put on the board, before heading down. Scaling the sand dune hills is really an effort. We were listening intently while Mark Manahan of LEAD demonstrated and gave important tips on how to sandboard and with each word, each sentence, my excitement of trying it out grew all the more. With his feet strapped to the home made sandboard, he stood up, moved his body to position it into place, stood and swooshed down the steep incline and it was all over in just a matter of seconds. Without waiting for others to fall in line, I immediately and confidently, in a loud voice, announced that I will slide down next and try it. That just calmed my nerves a bit and the thought of going down with grace was in my mind. I strapped on the sandboard and trying to remember what Mark just instructed but it all came a blur. Thoughts racing if I made the right decision and answering myself affirmatively. My companions were now cheering me from the sidelines and that further gave me confidence. Anton Diaz slaloms to the bottom. Expect to fall and not do right when sandboarding. But it’s still fun! The sun was already beaming down on me but still not hot enough to sear. The wind was calm and a cool breeze just passed. I surveyed the area, looking far, then below. This is it. Just balance. Right leg front, left leg supports my weight. Heart was pounding. I crouched a little and moved my body until I felt the slide and little by little, the sandboard inched forward, and then I was off, howling into the horizon! Or so I thought. Not for long. Within seconds from setting off, I miscalculated my balance and fell down. Stop! A little further from the middle that the exhilaration was cut off and I just buried the back of my head in the sand. I was laughing at such sillyness but had great, great fun! If you are visiting the place, it’s better to get in touch with the Paoay Off Roaders and Adventure Group (Gilbert Santos, +63 928 9473518, [email protected]). LEAD (Reny Tan, +63 908 8853669, www.wentravelandtours.tripod.com) also offers this one. I did sandboarding in Chile and while it truly is fun, I ended up feeling queasy from motion sickness. I’m glad there’s something new for Pinoys to try these days. i really liked this post — reminded me of the many places i wanted to go and the things i wanted to see.